Our sea level research at CSIRO's Oceans and Atmosphere Flagship and the Antarctic Climate and Ecosystems Cooperative Research Centre (ACE CRC) is focused on understanding recent (20th century and early 21st century) sea level change as a basis for improving projections of future sea level rise. We use data from tide gauges and satellite altimeters to determine past changes in global mean and regional sea level. We also attempt to understand the reasons for past changes and and use model results for improved projections of future sea level rise. Estimating long term Global Mean Sea Level (GMSL) using a combination of long tide gauge records and the much shorter satellite altimeter record, which started in the early 1990s. Study of sea level at islands (e.g. the Maldives and Tuvalu) at risk of inundation. Study of the effects of sea level rise and other climate factors on the frequency and magnitude of extreme events. Calibration of satellite altimeters at our dedicated site at Burnie (NW Tasmania) and a networks of gauges in the Australian region. Comparison of observed changes with model simulations. To narrow estimates of the rate of 20th century global-averaged and regional sea level rise. To improve estimates of the different contributions to 20th century sea level rise. 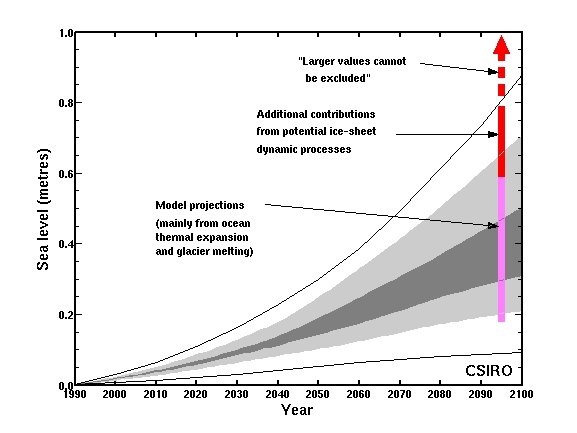 To significantly reduce the range of 21st century projections of sea level rise. To forecast change in extreme events during the 21st century for strategic locations. 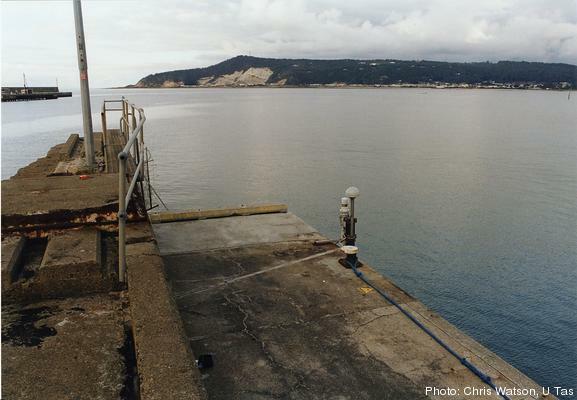 To address key uncertainties in the longer-term projections of sea level rise. Projected sea level rise for the 21st century: The projected range of global averaged sea level rise from the IPCC 2001 Assessment Report for the period 1990 to 2100 is shown by the lines and shading. The updated AR4 IPCC projections made are shown by the bars plotted at 2095, the dark blue bar is the range of model projections (90% confidence limits) and the light blue bar has the upper range extended to allow for the potential but poorly quantified additional contribution from a dynamic response of the Greenland and Antarctic ice sheets to global warming. Note that the IPCC AR4 states that "larger values cannot be excluded, but understanding of these effects is too limited to assess their likelihood or provide a best estimate or an upper bound for sea level rise."